Rice (Oryza sativa L.) is the world’s most important crop and is considered to be a primary source of food for over half of the world’s population. In 2017, rice cultivation globally occupied an area of 166 m ha, with a production of 758.8 m t of paddy. More than 90% of the world’s rice crop is consumed in Asian countries, which account for about 60% of the earth’s population. Rice blast caused by the fungus Magnaporthe oryzae is one of the most severe diseases of rice. This pathogen is highly variable in nature. It attacks all developmental stages of rice, causing losses of around 10–30% annually in different rice-producing areas. The pathogen can infect several organs of the rice plant, such as the leaves, collars, necks, and panicles. Chemical agents have been used to combat several soil borne pathogens including Magnaporthe oryzae, but our environment is severely degraded by the use of chemicals that pollute the atmosphere and leave harmful effects. The excessive use of pesticides is responsible for the degradation of soil conditions, but this degradation can be limited by the use of targeted bioagents that are antagonistic to pathogens. The reduction of chemical pesticide use in agriculture is achieved by the integration of biocontrol agents, botanicals, and minimum doses of chemicals. Various management strategies, such as the controlled use of nitrogen fertilizers, the application of silica, and the flooding of fields have been used for a long time to control rice blast disease. Scientists are keen to develop durable resistant rice varieties through the pyramiding of quantitative trait loci and major genes. 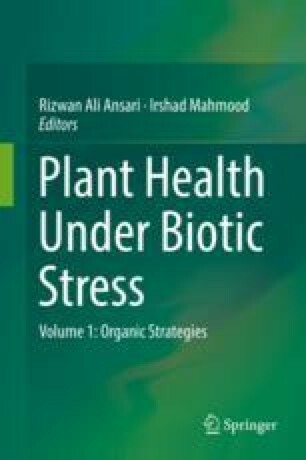 New strategies, such as the characterization of the R and Avr genes of rice, and biotechnological approaches that lead to the development of resistant cultivars should act against rice blast disease. However, the exploitation of durable host resistance remains a challenge for plant pathologists.